Town - Ravensden at RavensdenTownRavensden, or "Valley of the ravens" is a Saxon name, but it does not appear in written records until 1177, in the charter by which Newnham Priory was formed. Ravensden Church was granted to the priory to give it financial support. The south entrance, in the Norman style, is the oldest part, so the existing church was probably built around 1177. At Mowsbury Hill in the south of the parish there is a complicated system of earthworks formed by an iron-age hill fort and the moat of a Medieval manor. To the north of the parish is Tilwick, a deserted hamlet site. Roman and other pottery fragments indicate that the settlement was occupied until the 14th century, presumably abandoned when Warden Abbey, who used to own the land, turned it into a sheep range. Now, all that remains standing is a rapidly decaying 16th century farmhouse. Most Bedfordshire villages have "ends" i.e. detached hamlets away from the central area. Ravensden is all ends and no middle. What has been the central area of population, Church End, is in fact, hard against the Parish boundary with Renhold. Other ends are scattered around the boundary. Tilwick was one such end and Struttle End Farm marks another. This was once the home of the Wagstaff family. The surname "Wagstaff" indicates a minor official such as the bailiff of a medieval estate. The Wagstaffs of Struttle End served as bailiffs to Ralph Morin, who held the manor of Mowsbury. Ralph Morin was involved in a dispute over fishing rights and he elected to have the issue decided by trial by combat and appointed Adam Wagstaff to be his champion. Adam must have been a man to be reckoned with as Ralph's opponent backed down. There is a little terrace of cottages half way up Church Hill, which until very recently housed a pub called The Case is Altered. Local tradition has it that the name derives from the fact that it was once the parish poor house. Another thatched cottage, Oak cottage, was the home of another pub before the modern Horse and Jockey was built. At the other end of the village. Copper Cottage, now drastically rebuilt, owes its name to the days when it was home to Ravensden's village bobby. The green lane which runs along side Copper Cottage is part of an ancient cross-country highway which ran from Harrold to Biggleswade. The Kimbolton Road was cut through at the beginning of the 19th century when it was built as a turnpike road. It was then that Ravensden Cross Roads was formed. This is now the main growth point of the village. The one old thatched cottage, the Old White Lion, was once a pub but its license was transferred across the road to The Blacksmith's Arms as recently as 1941. On the edge of Bedford, Ravensden is under pressure to provide land for new housing. In spite of this it retains its rural character, with hedgelaying and hedge planting to be seen, particularly along roadsides. There is also a variety of arable and livestock farming and a number of woodlands. Putnoe Wood, on the edge of the parish, is open to the public. Putnoe Wood is a Local Nature Reserve and mixed oak and ash wood with a shrub layer of hazel. The hazel is still cut (coppiced) on a regular cycle to provide poles for crafts. Coppicing encourages growth of early woodland flowers such as snowdrop, daffodil, bluebell and primrose. Ravensden Brook runs through the valley and is an important wildlife corridor. Animals move from one part of the countryside to another along the brook, and the larger trees, grasses and scrub provide places to nest, food for birds and a home to many insects. 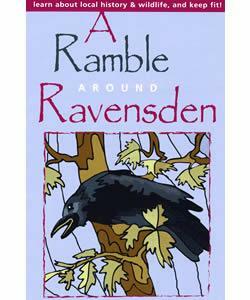 Ravensden, or "Valley of the ravens" is a Saxon name, but it does not appear in written records until 1177, in the charter by which Newnham Priory was formed. Ravensden Church was granted to the priory to give it financial support. The south entrance, in the Norman style, is the oldest part, so the existing church was probably built around 1177.